With the expertise and resources of a large firm, yet the personal service of a small company, we believe in providing personalized and reliable waste removal services delivering on time and on-budget. We do not believe in an automating answering service so when you call you will be speaking directly to Jay or Heather Reid. We handle both residential and commercial projects and stay versed in the latest industry techniques and regulations. Our 10 and 15 yard dumpsters are an affordable choice for homeowners, contractors, and business owners that need a temporary dumpster on site. 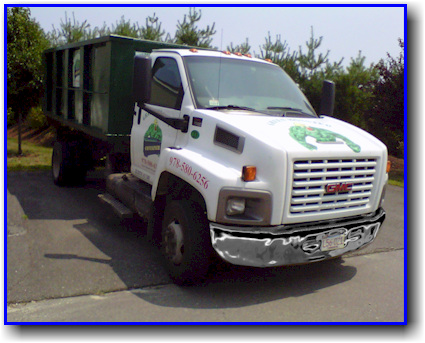 We strive to provide our service at the lowest and most competitive dumpster rental prices in Massachusetts. Why pay more for a junk removal service? The economical way is to rent a temporary driveway dumpster and fill it yourself. With a trash removal dumpster on site, you have the time to do the job right. Our containers are perfect for cleaning out your basement, garage, or an entire house. Call us for a quote. Our dumpsters are reasonably priced for your construction debris removal projects such as roof tear-off and replacement, remodeling projects or general demolition work. Call us for a quote. Just give us a call and tell us what kind of job you are planning. Let us help you figure out what size container you'll need, giving you the best value and helping your money go the furthest. Render time: 0.0424 sec, 0.0077 of that for queries.